We know how important life insurance is, and yet more than 40 percent of Americans have no life insurance coverage of any kind, according to the 2015 Insurance Barometer Study by Life Happens and LIMRA. Why is life insurance so important? Why might you need it? Could you face greater risk NOT buying life insurance than budgeting for it? There’s no doubt that the Internet, when in the wrong hands, can become a scary place where not everyone has the best of intentions. Today more than ever, teens and younger children need to learn not only how to handle strangers face-to-face, but also how to protect themselves from strangers on the Internet. According to a recent study from the Pew Research Center, 92 percent of teens report going online daily. Yet, a child sometimes doesn’t even have to communicate with a stranger directly in order to give information that could be harmful. Strep throat can be a very painful and contagious infection. While anyone can catch strep throat, it is most common among school-age children and teens between the ages of 5 and 15 years old, as the bacteria that causes strep throat spreads most often during the school year when large groups of children are in close quarters, according to the Centers for Disease Control and Prevention (CDC). Video: Who is Gerber Life? 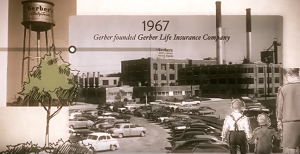 Since our launch in 1967 by the Gerber Products Company, “the baby food people,” Gerber Life Insurance has stayed true to the Gerber mission – helping parents to care for their children. Throughout the years, our company and our insurance policies have met the evolving needs of families all over the country. It all started with the Grow-Up® Plan1, an affordable whole life insurance policy designed to give kids a powerful head start in life, and has grown to include various coverage options for adults, as well as the Gerber Life College Plan2 – an endowment policy with an adult life insurance benefit that provides a safe and reliable solution for paying for college expenses. Our insurance evolves with the generations, but one thing remains constant: We continue to honor the legacy of Dan and Dorothy Gerber through our commitment to help parents care for their children, by providing the peace of mind of knowing that their children can have greater financial security no matter what life has in store. Kids seem to grow up overnight. 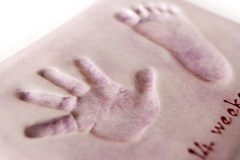 Although you can’t stop the hands of time, no matter how much you’d like to try, you can capture a fleeting moment of your child’s formative years by creating a plaster cast of his or her hand or foot. As your child grows, it can be fun to reminisce about how small he or she used to be. This DIY craft project – how to make a plaster cast – is easier than you might think.